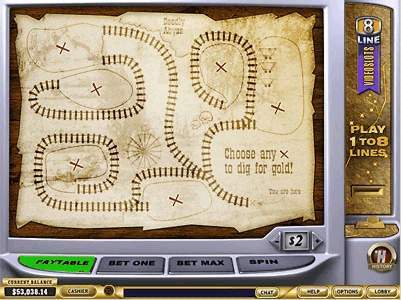 Gold Rally is a 9-reel, $2 coin, 8-line bonus stage progressive slot machine developed by Playtech. The progressive jackpot is only available if you play max number of coins or at least $2 per spin. Get 9 scatter symbols on the screen in one round while playing Max Bet to scoop the grand jackpot - accumulated from the deposits of gold diggers like yourself in all participating Playtech online casinos. In bonus round X marks the spot on this tattered old map where a great fortune lies buried. The Gold Rally progressive jackpot starts at $/€100,000 and has gone off at over $/€2,000,000; the average jackpot hit is about $600K. With the horses a' gallopin' and them wild boys shootin' off their guns, things sure can get a little wild on this here Gold Rally! With the cool evenin' breeze on yer face and your eyes set firm'y on the horizon, you know you is goin' to strike gold, one way or another. And just listen to those crazy fools go bonkers every time you win? Must be Crumpy Joe's good ol' moonshine, 'guess. Pack yer dynamite and prepare them booty bags, 'cus you all be pillin' them gold carts up mighty high! Big winners: Timothy P. won $1,761,803 on 13 January 2006 in Casino Tropez, while the largest jackpot ever won by players was Mikael N's $2,738,050 at Europa Casino. 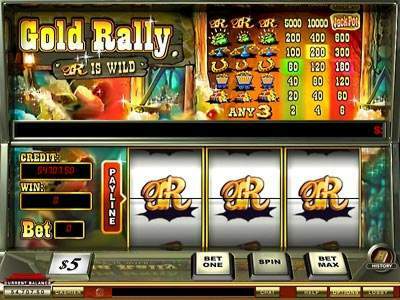 This Gold Rally jackpot has been won in February 2008. See all Gold Rally jackpot winners and their stories and interviews. You could be the next millionaire.. Good Luck!